To promote and foster friendship and understanding between the people of Szeged, Hungary and of Cambridge, United Kingdom. To encourage groups or individuals to develop cultural links through visits, joint projects in areas of mutual interest; to encourage individuals or companies to develop business links; to inform local people and increase their awareness of the links between the two cities; to act as a communications link and to provide a meeting place for all those interested in matters Hungarian. To promote co-operation between ‘town and gown’ in Szeged and Cambridge. To organise fund-raising activities to foster the aims of the Society. To co-operate with the sister-society in Szeged and exchange information, ideas and experience. THE HISTORY OF SZEGED goes back to 1183 and its connection with salt mines in Transylvania; it became a royal city in 1498. The city is situated on the junction of two rivers, the Tisza and the Maros, south of the Great Hungarian Plain known as the Puszta. In March 1879 the Tisza flooded and only 300 domestic houses were left standing. However with remarkable speed the city was rebuilt, greatly helped by funding from other European cities. The overall street design is based on that of Paris; the town buildings are on a grand scale and cover a wide variety of styles. Architects know Szeged for the eccentric art nouveau buildings of Ede Magyar, and one of the finest synagogues in Europe. THE PRESENT DAY population of Szeged is about 200,000. 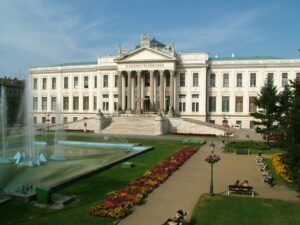 It is an important industrial centre of the region (with oil and natural gas); it has two universities, the Hungarian Academy of Sciences Institute of Biology and the Horticultural Research Institute: like Cambridge, the university buildings are mingled with the town. Szeged is a focus of cultural life in southern Hungary with an annual festival of music and drama, drawing people from Hungary and beyond. The Cathedral Square (Dóm tér) is converted into an amphitheatre from June until August and is always booked out. WALKING ROUND SZEGED is a real pleasure since there is remarkably little traffic, the impression is of wide, spacious, tree-lined streets, gardens, attractive and colourful buildings and, since the fall of communism, a great deal of renovation. Strings of red paprika hang from the shop windows – the bulk of Hungarian paprika is grown in the surrounding countryside. The town claims to be the city of sunshine: in the summer families converge on the large swimming pool and its surroundings near the river. Almost as many crowds make their way to Virag’s famous patisserie and ice cream parlour where there is some of the best ice cream to be found anywhere in Europe.